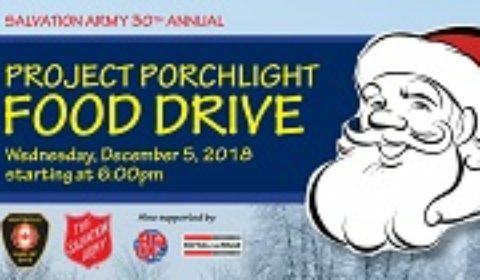 30th annual Huntsville Fire Porchlight food drive on Wed. Dec. 5 at 6 p.m.
HUNTSVILLE — Tonight’s the night in Huntsvile 30th annual Huntsville/Lake of Bays Fire Department’s Project Porchlight Food Drive, Wednesday Dec. 5, starting at 6 p.m.
Project Porchlight is an evening when the flashing lights and the wail of sirens is something to feel good about, as fire trucks, ambulances and police cruisers go door-to-door collecting healthy non-perishable food donations. They ask thay you please leave your porch light on and firefighters along with Santa and other community volunteers will be by to pick up your food donation. The collected food is distributed by the Salvation Army to those in need within the community throughout the year. “Project Porchlight has been a real tradition with the members of the fire department for 30 years now, and everyone, from the Salvation Army, the volunteers and the residents who contribute, are so supportive and giving. We are truly grateful for that generosity” said Mike Vadlja, fire prevention officer for the Huntsville/Lake of Bays Fire Department.  The Salvation Army in Huntsville; 4 Mary Street E.
 Lake of Bays Fire Halls, 1007 Limberlost Rd., 1230 Fox Point Rd. and 12 University St., Baysville.